How to Get Help for an Alcohol Problem? Help for an alcohol problem is easy to find, but it is not always easy to ask for. Overcoming an addiction to or a dependency on alcohol can be a long and sometimes frustrating process, but if you've made the decision to stop drinking you've crossed the most important hurdle in your recovery. No matter how bad your alcohol problem is or how helpless you feel, there is help available if you're willing to reach out for it. You don't have to wait until you've hit bottom or until your alcohol problem has begun causing problems in your life and with your relationships with other people to admit you have a problem or seek help. You can successfully overcome alcohol addiction or dependency at any time. While there are several choices available for treatment, getting help requires just a willingness to change your life. The first step in recovering from an alcohol problem is seeking help. To look for the right help, you need to be able to determine whether or not you have a problem. You frequently feel the need to have a drink. You find that you get into trouble with family, friends, work or the law because of your drinking. Others have warned you or expressed concern about how much you're drinking. If you find that you think about drinking constantly, or you feel the need for a drink every time you are upset, angry, sad or even happy, you may have a problem with alcohol. If you find that the amount you drink or the way you behave while consuming alcohol gets you into trouble, or that family and friends have expressed concern or warned you that your drinking exceeds normal limits, then it may be time to seek help. Where Does a Person Seek Help? The first place many people can find help for an alcohol problem is their family physician or a general practitioner. Make an appointment to discuss your concerns over your drinking and be honest about how much you drink. If you've become dependent on alcohol, simply stopping overnight can be dangerous. Your physician can help advise you on whether cutting back gradually or quitting cold turkey is the best way for you to manage your dependency on alcohol. Your doctor may also refer you to a community service where you'll find support groups and counseling to help you recover. In some cases the body is so dependent on alcohol that side effects called withdrawal symptoms may occur. If this is true in your situation, your doctor may prescribe medication to help relieve or reduce these symptoms. The key to success when getting help for an alcohol problem is support. This is crucial to understanding and successfully overcoming the problems and triggers that make you drink. Many people find community organizations or groups such as Alcoholics Anonymous offer enough support to break their dependency on alcohol, but some require more support than these can offer. For example, a short stay in a residential treatment facility can provide you with around the clock medical care and monitoring so that you can stick to your goal of recovery through withdrawal symptoms and emotional or other health problems. Residential facilities may be a general hospital treatment program or a private rehabilitation center. Both of these options are usually recommended for people with medium to high levels of alcohol dependency. 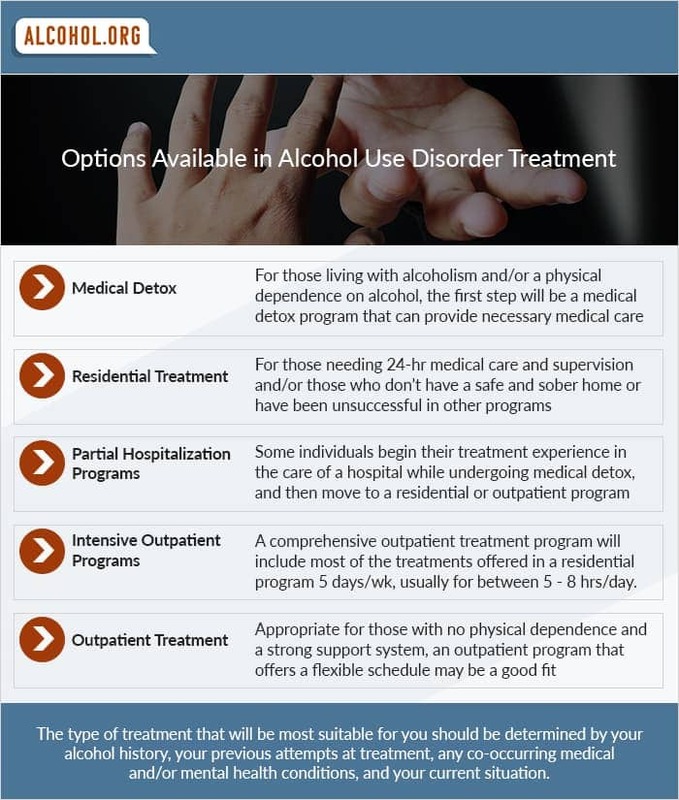 Your time in these facilities is structured and you receive both group and one-on-one counseling to help you through your recovery from alcohol dependency. When you speak to your doctor, they may refer you to one of these facilities or you may wish to enter a private facility. Whichever you choose, if you feel the need to seek help for your alcohol problem you should do so immediately.